The Dominicans established a priory in Holborn, London in 1223, and dedicated the church to Our Lady and St John the Evangelist. In 1276, Edward I gave them permission to move to a site between the River Thames and Ludgate Hill. Until its dissolution in 1538, the Blackfriars – as the Dominicans came to be called – had their great priory on this site, which is still called after them. 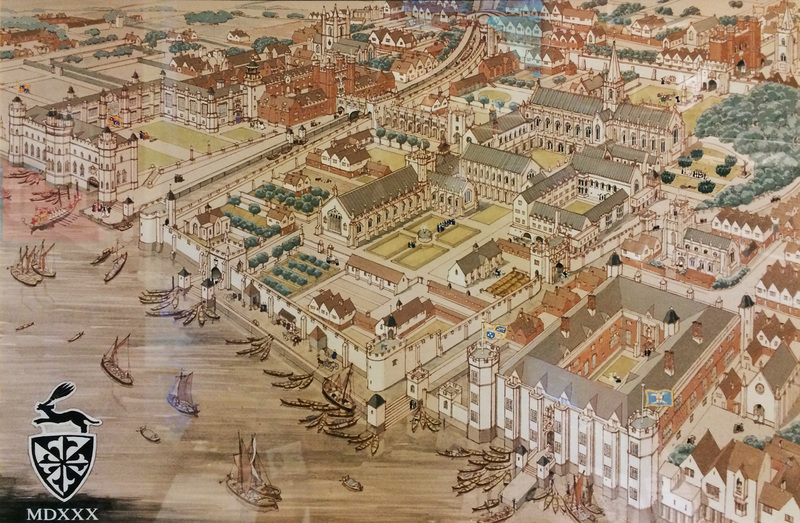 The medieval Blackfriars of London was used for great occasions of state, including meetings of Parliament and the Privy Council. In 1529, the divorce trial of Queen Catherine of Aragon and King Henry VIII was heard there. ‘Blackfriars’ persists as a placename to this day in the City of London. When Queen Mary Tudor ascended to the throne, she gave the church of St Bartholomew the Great, Smithfield to the Dominicans in 1555 as part of her attempt to restore the Catholic Faith in England, but she died soon after, and so too did Dominican life in London with the suppression of that house in 1559. Made Vicar of the Province in 1661, Fr Philip Thomas Howard OP established a priory in Bornhem (outside Antwerp) and this became, “a real oasis in the desert” for the English friars in exile. It was followed in 1695 by a small house in Louvain from which the English friars could study and teach in the university. The tumultuous eighteenth-century and the French Revolution put an end to Bornhem and Louvain, and the friars fled to England but were they were not permitted to open a religious house. In 1810, fr Dominic Fenwick OP and several of the younger English Dominicans left for the United States of America where the prospects of a religious life looked brighter; they started what is now St Joseph’s Province or the Eastern Province of the USA. The middle of the nineteenth century saw both the Catholic Relief Act of 1829, bringing an emancipation of the faithful, and a great influx of Catholic immigrants into England. Records for the 1860s show Catholic Churches springing up all over London, many of them run by religious orders.